The Hood Cafe is located on the corner of Kenrick St and Union St.
First things first, it has an awesome gelato bar- hello new favourite hang for summer. I got my usual cappuccino which was really lovely and smooth, not the best but close. La and myself also got a breakfast juice each- freshly made kale, apple, celery and ginger which was amazing. A1 & D2 also got freshly squeezed juices: tropicana- passionfruit, orange, lemon and strawberries, also amazing. Wolf got the chai tea which she said was also lovely. All in all an easy 9/10 from us. Being a very new cafe and very busy there was a wait on food, but the waitstaff were lovely and were very apologetic. A1 and myself go the egg benedict brioche roll with ham, which was extremely delish. La and Wolf got the smashed avocado and both added mushroom, both said it was a 9/10 based on taste, and would've been a 10/10 if it had another piece of sourdough to make it a little more filling. D2 got the poached eggs on toast with relish and added bacon, very yum. The gelato was so full of flavour they were amazing! Some of the flavours include: peanut butter choc chip, coconut, chai... they also have some lovely sorbets. So overall a 9/10 for food from us. The Hood has it's hipster thing going on. And who can go past that gelato bar! As The Hood has taken over both the corner Fruit Shop and Video Easy, so they have turned a big space into I am sorry but again, an amazing gelato bar and cafe with plenty of seating including funky booths. From what we've seen the waitstaff are lovely and attentive. All in all easy 5/5 for atmosphere from me. All in all The Hood is shaping up to be a favourite hot brunch/ breakfast/ gelato haunt this summer. I know I will be there!! The Hood's coffee and juices were really really good, especially their juices. Their food is full of flavour, and we would've given them a 10/10 if they were a bit bigger. Atmosphere was everything you wanted from a funky cool hipster cafe. All in all a high recommendation from us at NWB. Don't forget to try the gelato! Ja, A1 & D2 on Paleo Cafe. Paleo Cafe is located 52 Cleary St, Hamilton. I was a bit greedy and got a cappuccino and the smoothie of the day which was Bounty themed: coconut and chocolate. D2 also got a cappuccino and we both thought they were really good and smooth; and the smoothie was also really good, tasted exactly like a liquid bounty. A1 got a black tea, which he said was good, standard. All in all drinks get a 8/10 from us. Paleo Cafe focuses on healthy eating and good quality food. We were very pleased to say they did not disappoint. I got the Chilli Eggs, poached eggs, baby spinach, coriander, avocado topped with chilli capsicum on the special Paleo bread. A1 got the Eggs Benedict with veggie rosti on the special Paleo bread. D2 got the Bacon and Free Range Eggs. Everything was really really delicious, and we enjoyed the display. The only criticism we had was the meals were a little too small, so delicious but just needed a little more, more bread maybe. Other options include muesli, Banana Pancakes (which the table next to us got and looked AMAZING), Smashed Avocado, Caveman Big Breakkie and BBQ Pulled Pork. They also had a cabinet of small treaties which looked amazing! Would like to come back and give some a try. Overall food gets a 7/10. The cafe had a really clean, fresh, healthy, chic vibe about the place. The orange and white colour gave it a really fresh feel about the place. They had a small healthy grocery section in the cafe and a small fridge filled with organic water and nudie coconut water, that is quite reasonably priced! Overall I really enjoyed the change from my usual hipster haunts, Paleo Cafe had a really chic feel about it. A 5/5 for me! The cool chic, healthy eating fresh Paleo Cafe lived up to expectations of healthy eating and quality food. All our food was really delicious and fresh, though it was not as sizable as we would've liked it. Coffee and drinks were also amazing, really smooth coffee and tastey smoothies. 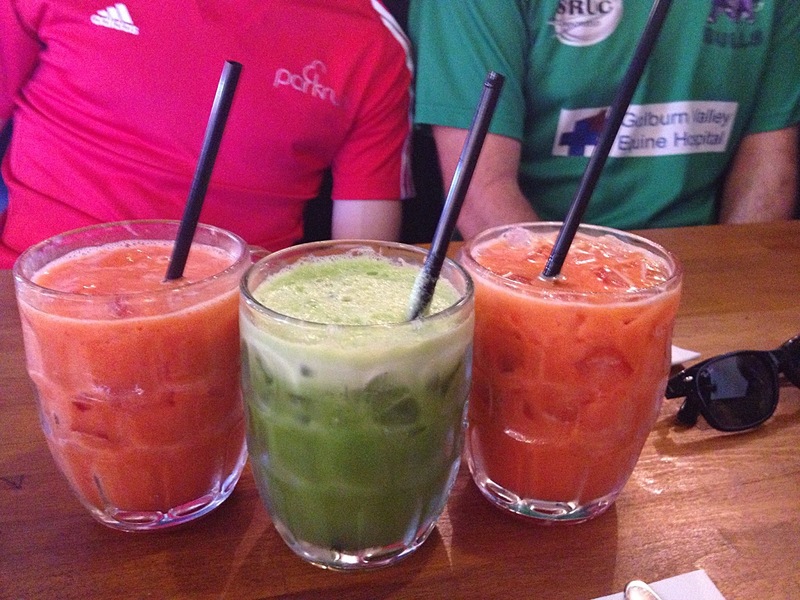 I would recommend people to go for coffee, food and atmosphere in Hamilton to Paleo Cafe. Overall rating is 20/25. Ja, La, Le A1, and Wolf on Ground Up Espresso. Ground Up Espresso is located at 87 Young St Carrington. As per usual I got my cappuccino and Wolf also got one and our coffee verdict is: smooth, very good coffee. We really enjoyed them. A1 and Le got smoothies, a strawberry and a mixed berry which they were a little disappointed with. Not a big thing but they didn't put on the menu they put honey in their smoothies, which A1 and Le really didn't like. So overall rating is hard to give so a 7/10 because the coffee is really good, but the smoothies were disappointing. A brunch-breakfast menu gave some basic but delicious sounding options. I got the cream cheese and smoked salmon on sourdough which was really good, basic but really nice. La got the avocado and lemon on sourdough, again basic but she really enjoyed it. Wolf got the tomato and hommus on sourdough, again basic but delish. A1 got the breakfast wrap, which was really nice but could've been a bit bigger. We all rather enjoy a little something sweet after breakfast so we got a banana bread and a pear and raspberry bread to share between us. Really nice! Other brunch/ breakfast options included blueberry bagel, croissants and toasties. Overall food rating was 6/10. Ground up espresso has that funky hipster we make really good coffee vibe about it. As you know I do love a hipster cafe, this one ticks all my boxes, a really lovely cafe to go for coffee and some brunch. A 5/5 atmosphere for me. Ground Up Espresso had really great coffee but the smoothies were a small let down. The brunch/ breakfast menu was basic but had some delicious breakfast options, good food. Atmosphere was funky, hipster definitely my style of breakfast spot. Overall Ground Up Espresso got a 18/25 from us.